President Donald Trump has said “it is time for the US to fully recognize Israel’s sovereignty over the Golan Heights”. What is this area, who lives here, and why is it contentious? The Golan Heights are a fertile plateau of around 1,300 sq km area lying to the north and east of the Sea of Galilee, which Israel seized from Syria during the Six-Day War of 1967, and has occupied ever since. The Golan overlooks both Israel and Syria, and offers a commanding military vantage. Syrian forces made an abortive bid to take it back during the Yom Kippur War of 1973; the 1974 ceasefire agreement, however, left most of the area in Israeli hands. In 1981, Israel passed the Golan Heights Law, which extended Israel’s “laws, jurisdiction and administration” to the area, in effect annexing it. A UNSC resolution declaring the imposition of Israel’s law “in the occupied Syrian Golan Heights… null and void and without international legal effect” has not changed the situation on the ground, although the frontier has not seen major hostilities for more than 40 years. In 2000, Israel and Syria made a failed attempt at negotiating a settlement. Around 50,000 people are estimated to live on the Golan, divided almost equally between Israeli Jewish settlers and Arabic-speaking Druze people of Syrian origin, who follow a monotheistic Abrahamic religion related to Ismaili Shia Islam. The Druze have remained loyal to the regimes of Bashar al-Assad and his father Hafez al-Assad over the decades, and refused Israeli citizenship. Trump’s tweet marked a reversal of decades of US policy, which has refused to condone the Israeli occupation of Golan, and urged that the dispute must be resolved diplomatically. The President has earlier recognised the disputed city of Jerusalem as Israel’s capital, moved the American Embassy there from Tel Aviv, and stopped aid to Palestinian refugees. Last year, the US voted against a ritual annual UN resolution condemning Israel’s continued seizure of the Golan Heights. Because nothing is happening on Golan and nobody expects Israel to pull back in any case, Trump’s tweet does not change anything — what it does, however, is extend legitimacy to Israel’s position, and boost Israeli Prime Minister Binyamin Netanyahu’s hardline agenda as he seeks a fifth term in the April 9 elections. Israel argues that Golan is a security buffer against the war in Syria, and Netanyahu has said that if Israel were to withdraw, it would have “Iran [which backs Syria’s Assad and has vowed Israel’s destruction] on the shores of the Sea of Galilee”. In 2014, rebel forces fighting the Assad regime took control of the Quneitra province on the Syrian side of Golan, but government forces took back the territory last year, and began facilitating the return of UN troops to their positions. The United Nations Disengagement Observer Force (UNDOF) and United Nations Truce Supervision Organisation (UNTSO) have camps and posts in the area. 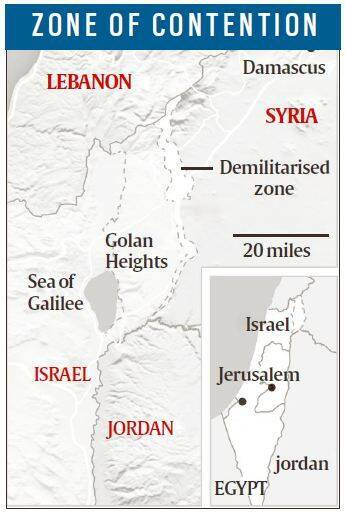 The Israeli and Syrian armies are separated by a 400 sq km demilitarized zone which neither side can enter. There is a solitary crossing, which, before the beginning of the civil war in Syria, was used by UN forces, Druze civilians, and to transport agricultural produce.